Published: June 26, 2013 at 08:31 a.m. Updated: June 27, 2013 at 10:34 a.m. The Jacksonville Jaguars, Miami Dolphins and Minnesota Vikings used this offseason to tweak their game-day threads. Now the San Diego Chargers have jumped on board. The team on Monday announced its first uniform alteration since 2007. The changes are minor, affecting most noticeably the nameplate on the back of the uniform, which now features gold lettering with a sharp, powder blue outline. 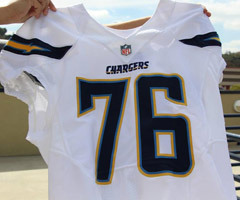 "We changed the nameplate on all three of the jerseys," Chargers CEO A.G. Spanos told the team's official web site. "We had wanted to go to a two-color font. Most teams in the league use a two-color font and it really highlights the name. It looks a little bit sharper and a little bit more modern." Added Spanos: "It's reminiscent of the 1980s teams because they had gold nameplate font as well." The second tweak affects the collar, which will now blend in with the rest of the jersey (white collars on white unis and navy blue on navy blue). For you diehards, the third tweak includes a gold stripe added to the socks. There were no changes to the team's helmets or pants. The Chargers boast one of the NFL's prettiest getups. We're glad they didn't toy around with a good thing. You can take a look at the changes here.